Black rice is still relatively rare in the United States, but 21st century food scientists are discovering that, when it comes to nutrition, black rice has many health benefits. In ancient China, nobles took possession of every grain of the "forbidden rice," and common Chinese people were not allowed to have or eat black rice. 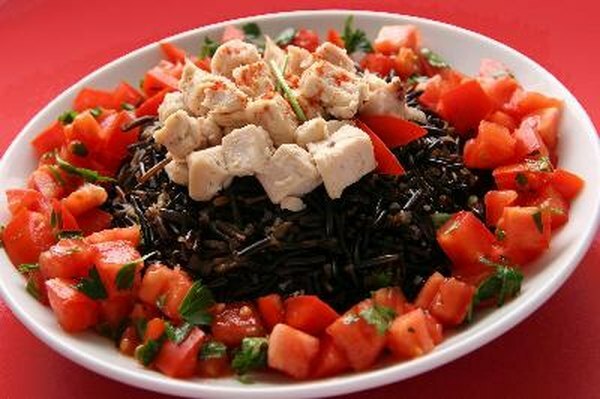 Black rice was first introduced to the United States in 1995. Currently, you can buy it at natural grocery stores, but as people discover and demand it, black rice will probably become more widely available at supermarkets and restaurants. Nutrients are lost when the outer layer of any type of rice is removed during the milling process for making white rice. Brown rice and black rice are antioxidant-rich, but only black rice contains anthocyanins, the purple and dark red pigments that color and add valuable nutrients to blueberries, grapes, blackberries, dark cherries, raspberries and acai berries. Anthocyanin antioxidants are associated with health benefits, such as memory improvement and decreased risk of heart disease and cancer. The health benefits of black rice are found in the bran of the rice, so to obtain the most nutrients from black rice, choose whole grain rice and products that contain whole grains. When you check nutritional content and ingredients in the food you buy, look for the words "whole black rice" at the top of list. Black rice is a healthy source of minerals, especially iron. It contains vitamin E and is lower in sugar than berries that have similar phytochemical qualities. Black rice is fiber-rich and nutritionally similar, though not identical, to whole grain brown rice. Black rice bran is rich in phytochemicals, so adding it to your diet could help you improve and maintain your health. Black rice researcher, Dr. Xu says, "If berries are used to boost health, why not black rice and black rice bran? Especially black rice bran would be a unique and economical material to increase consumption of health promoting antioxidants." You can make homemade black rice bran powder by grinding dried kernels in a coffee grinder. Put the powder on fish or in pancakes to add flavor, nutrients and color. Food manufacturers could use black rice bran and bran extracts to increase the health benefits of breakfast cereals, drinks, baked goods and other foods. Black rice extract’s natural colors may offer a healthy alternative to the artificial food colorings some manufacturers add to beverages and foods. The pigments in black rice extracts can produce a variety of colors, from black to pink, which might make the powder of black rice bran a good source for natural food coloring. The 2011 “New York Times” article, “F.D.A. Panel to Consider Warnings for Artificial Food Colorings,” discussed possible connections between artificial food colorings and health conditions such as cancer, allergies and children’s physiologically-based behavioral problems. CNN; Is Black Rice The New Brown?